Creamy yogurt pairs well with fresh fruit and crunchy cereal. Add a light drizzle of honey and you have a breakfast or snack made for winners. You'll enjoy all of these ingredients in this recipe, but you won't need a bowl for them—just a large popsicle mold. Make ahead and enjoy this refreshing frozen treat on the go. It'll help you set a healthy tone with eight grams of protein per pop, and the calorie count and fat content are low enough that you can enjoy two during mealtime. Bonus: kids will love the fun colors and crunch. They can even help you mix the ingredients. Evenly divide mixture into the popsicle molds. Freeze for six to eight hours. There are several brand-name cereals—for both kids and adults—that add nutritional value. As a general rule of thumb, navigate supermarket shelves and nutrition labels for boxes that list a whole grain as the first ingredient and contain at least three grams of fiber and protein, less than 10 grams of sugar, and less than 200mg sodium per serving. Some varieties of Cheerios, Fiber One, Kashi, Special K, and Post Shredded Wheat, for example, meet these guidelines. Whole milk Greek yogurt lends a satisfying creaminess to the final pops. It may also help you feel fuller. You can use non-fat Greek yogurt if you prefer—it'll shave about 30 calories and make each pop practically fat-free. You can easily vary the flavors of your pops without adding too many calories. Make a chocolatey version with an added tablespoon of unsweetened cocoa powder, which adds only a few calories to each pop. Mix in powdered peanut butter—it offers all the flavor with less fat. If you choose chocolate flavored powdered peanut butter, you can enjoy two flavors in one! 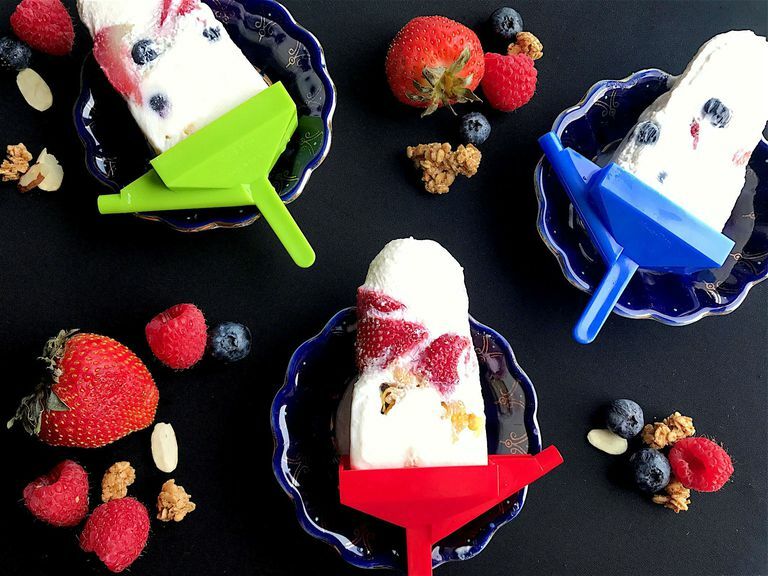 You can make bite-sized versions of these pops by filling an ice tray with the yogurt mixture instead of a large popsicle mold. If you have trouble removing your pops from the mold, run the bottom of the tray under hot water for about 30 seconds, then try to wiggle the pops out.